The last item on the agenda of last week's School Board meeting was a discussion of an operating levy in November. The discussion was inconclusive. The size of the levy. How long the Board commits to waiting until the next levy is put on the ballot. What rate of spending growth the levy is intended to fund. Unless the School Board discloses its intentions in regard to all four of these parameters, I believe that the public doesn't really know what it is 'buying' with a decision to increase property taxes. At the Retreat two weeks ago, we had consensus that we want it to be three years or more until the community is again asked to raise its taxes. That's one parameter down, three to go. For my own decision process, I selected the rate of spending growth as the next 'stake in the ground.' In the current Five Year Forecast, the annual growth rate for the period FY13-FY15 is 4.8% after backing out the 'make work' numbers that were inserted in order to allow the certification of the new union agreements. I think a 4.8% annual growth rate is too high for our current economic situation. In dollars, it is about $7.8m/yr, which is larger than any year-to-year increase in the last five years. In other words, while the new union contracts help a great deal by freezing costs over the next three years, this 4.8% annual growth rate puts us afterward right back on the same spending trajectory we were on before the new contracts. I'd like to see our annual rate of expense growth reduced to about 3.5%. Note that I didn't say we should reduce spending by 3.5%. I said that we should restrict the rate of spending growth to about 3.5%. In dollars, that would add about $5.5 million dollar per year to our FY13 budget of $159 million. ... that's two of the four: levy interval (3 years) and expense growth rate (3.5%). Next, I believe we should have a goal of restoring our cash balance to at least 5% by the end of FY15. That won't be without cost. 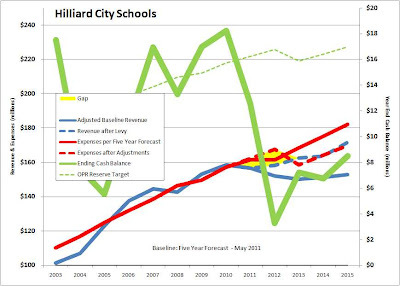 I estimate that it will require about 1.3 mills of our next levy just to get us back to a 5% cash balance by the end of FY15 (we'll run out of money in FY12 without a levy or more than $3 million in spending cuts). But we need to keep some cash reserve on hand to create 'wiggle-room' to deal with unexpected expenses. The current Board policy, set in 2006, is that this operating reserve will be kept at 10% of our annual operating expenses, which in FY11 would be about $16 million given our annual spending of $160 million. In recent years, this has been as low as 4.4% in FY05 and as high as 12.2% in FY07. That's three of the four parameters, and once you have three, the fourth is determined. In this analysis, the fourth parameter is the levy size. My calculations show that the answer is 5.9 mills in Nov 2011 and around 5.9 mills again in 2014, the three year interval. What if we don't want the next levy before 2015 - an interval of 4 years? Keeping the spending rate and cash reserve target the same, that means we need would need a levy of at least 6.4 mills. And there are many other scenarios we could talk about. Here are some I've been looking at in this process (warning: 3.5meg file). Last September, the School Board was asked by the leadership of the Columbus Metropolitan Library System to pass a resolution in support of their new levy, which appeared on the November ballot as Issue 4. I voted against this resolution, which passed 3-1 (Dave Lundregan was absent due to a business conflict). My reason was that the Library system was asking for a levy large enough to fund their operations for a 10 year interval, and I didn't feel comfortable turning over that much money to them, and trusting their current and future management to use it as promised. I have some of the same concerns in regard to our own school district. While few of us like the idea of having a levy issue on the ballot every 3 years, the reality is that - given any particular rate of spending growth - the longer you make the levy interval, the larger the levies have to be. 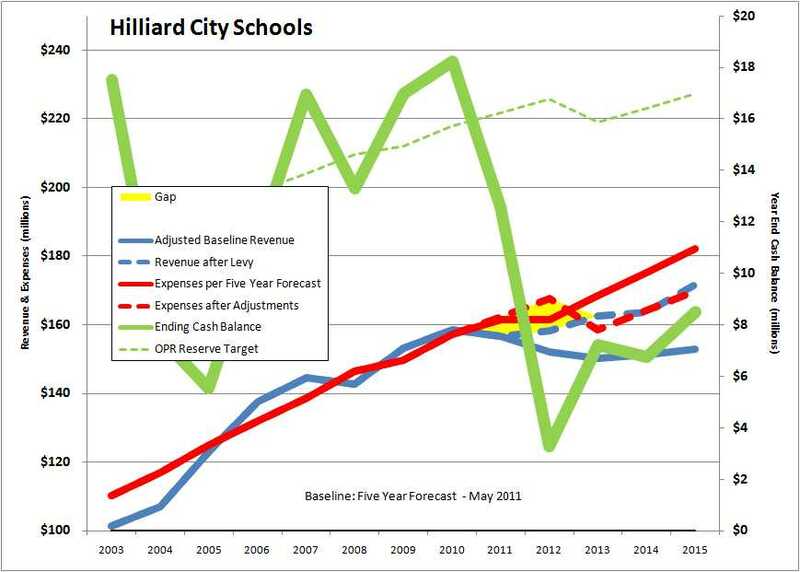 And it also means that in the first years of a levy designed to last 4-5 years (or 10 as was the case with the Library levy), there will be large cash reserves in the early years, and it could be pretty tempting for future School Boards to dip into those funds, forcing an early return to the ballot. So it seems to me that a three year interval strikes a reasonable balance. It's significantly less annoying and painful than every other year, but it's frequent enough to keep the levy size somewhat palatable. I also think it doesn't hurt that it forces the District leadership to stand before the people of the community and be held accountable for the way their money has been spent, if people care to ask the tough questions that is. What happens next will depend on how important President Maggied feels it will be to have a unanimous vote on the levy resolutions. Ohio law requires that 4 of the 5 Board members must vote in favor of the resolutions necessary to submit a levy issue to the Board of Elections. So it is possible for a levy resolution to go forward without my vote. However, I remain open to considering other combinations of the four parameters provided a meaningful reduction of the planned rate of spending growth is part of it.